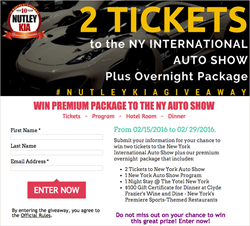 Nutley Kia, a new and pre-owned car dealership serving the communities around the Newark, NJ area, announced a New York International Auto Show (NYIAS) Giveaway, this February. As a part of their 10 Months of Giveaways to celebrate their 10-year anniversary, participants can enter to win a prize package including tickets and an overnight stay. This month’s submissions run the whole month of February. The Winners will be randomly selected and announced the first week of March on Nutley Kia’s Facebook page. NYIAS is one of the most anticipated automobile events in the world. As the first North American auto show, this infamous event is celebrating its 116th year with an all-new logo and more exciting fun activities, to bring all its participants the experience of a lifetime. Nutley Kia is a family-owned and operated auto dealer in Nutley, New Jersey. It offers a complete selection of Kia vehicles and used cars, as well as a wide array of benefits including low competitive pricing, flexible finance and lease options, VIP customer incentive program, and much more. Meet the staff and explore their selection of new and pre-owned vehicles at http://www.nutleyauto.com.